What Can You Do About Global Warming? 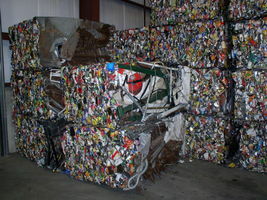 1 Caption: Steel cans crushed and baled for recycling in a recycling plant outside Galva, Illinois. More than 80 million tons of steel are recycled every year in North America. 2 For millions of years, energy has been pouring down onto Earth's surface from the sun. Some of the sun's energy is soaked up by rocks, soil, and water. Some of it is reflected back into the atmosphere. 3 Energy never disappears. It never appears out of nowhere. Energy cannot be created or destroyed; it can only be changed from one form into another. Some of the sun's energy is trapped by plants. Animals eat the plants and change the energy into another form. But most of the sun's energy is emitted back into space. 4 Earth is surrounded by an atmosphere. This layer of nitrogen, oxygen, and other gases acts like a blanket to keep most of Earth's surface at a livable temperature. If Earth had no atmosphere, heat from the sun would quickly be radiated back into space. Days would be baking hot, and nights would be freezing cold. 5 The efficiency of the atmospheric blanket depends on the gases it contains. The most important of these gases are carbon dioxide and water vapor. These allow energy in the form of heat into the Earth's atmosphere from the sun. But they keep it from leaving again in the same way that glass traps heat in a greenhouse. Coal and oil burning in power plants and gasoline burning in cars add vast amounts of carbon dioxide to the atmosphere, making Earth warmer. This is called the greenhouse effect. Feedback on What Can You Do About Global Warming?